Oh my gosh! THE Bob Fenner? We are in the process of moving to Malaysia (yes, tropical!) where we have space for a garden and a small garden pond or ponds (container and/or in ground). And have been thinking about what kinds of fish we can keep. Its very warm here 20s to low 30s in terms of air temperature. Once possibility we are considering are short-finned Bettas. I have kept B. splendens (veil tail, crown tail, super delta tail) in small tanks by themselves and a female in a community tank before, and they have lived a couple of years or more. Now we have gouramis (Trichogaster leeri) in our indoor tank. But now since we are establishing our tropical garden we are thinking about keeping tropical fish outdoors (may try breeding if all goes well). I suppose deep down I have a soft spot for Bettas. I have been doing some research since I don’t really want to keep the long finned varieties outside and a lot of these seem frail lately anyway. I actually prefer the short finned plakats (we have no intention of fighting these fish, just keep as pets) and some of the wild types like b. imbellis which are native to this part of SEA. I have read that Betta imbellis and perhaps b. smaragdina, b. mahachai, b. stiktos can be kept either in pairs or small groups (males and females) but I have also read and heard otherwise. It’s a little confusing as most people who are keeping these (aside from fish farmers/breeders) are keeping them in smaller tanks or large community tanks but I think in our case if we have them outside we can have a pond or two with 40 gallons to a few hundred gallons so we would not be so constrained in terms of space for these fish. If they thrive, we could try breeding. I’m not sure about plakats, but perhaps even these could stay together if the fish are all are females, with plants to hide among, or if the pond(s) were large enough. Or perhaps even a male can be kept with a number of females as long as they have enough space? I guess I’m thinking of Bettas as ideal for our (future) small to medium garden ponds because these lovely fish are native to Peninsular SEA so they can tolerate our warm conditions to begin with. We originally were thinking of Koi; many people keep Koi in this part of the world but I’m not certain we have the resources to maintain these fish in good health with our very tropical weather. We also enjoy greenery and gardening very much and Bettas should fine with water plants such as water lettuce etc. Apparently they eat mosquito larvae and small insects too. Hence in the long and the short of it, if one has the facility to keep Bettas in an outdoor tropical pond do you think is it possible to keep them in pairs or groups? Imbellis or Mahachai in pairs? Females in groups? More than one male with females if there is enough space (20 gallons of water per male fish?)? Hello, I recently brought a 12 gallon eclipse for a Betta fish but am now stuck on what variety to get. 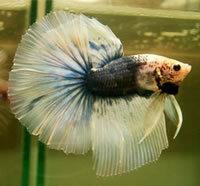 My problem is that I am stuck between a veiltail or a Halfmoon, and my main concern is behavioral. Are half-moons less active than veiltail, or does it not make any difference? "personality". Would you say that there is any truth to that statement? 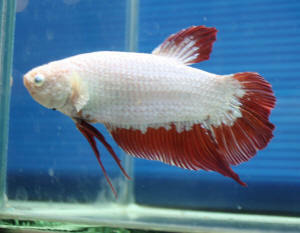 Also, if I were to get a different species of Betta, would the care be more difficult? 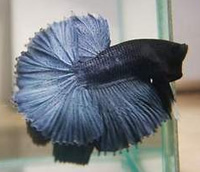 Would it be less likely to be interested in people/personable than Betta splendens? Are the giant varieties as easy to care for as regular sized ones? What heater would you recommend for a twelve gallon eclipse? I'm having trouble deciding on that, too. Hi WWM crew, let me start off by saying this is my favorite website for anything aquarium related, thanks for all your help. Now for the question; I know some of you might be from Southern California, and more particularly Orange County, CA. I was wondering if any of you know where I might be able to find wild caught Bettas offered for sale locally. Any information would be greatly appreciated and thanks in advance. <I do live in S. Cal. (San Diego), and know how I'd set out to find/purchase Betta spp., including other than splendens. Further, I'd contact the local "fish clubs"... there's a few in OC and environs, and ask whomever is listed as principal contact if they know of members who husband these Anabantoids. Lastly, am cc'ing Sabrina Fullhart here re... She is also keen on this group... and very likely has valuable input to offer. Cheers, and good hunting. I have to ask this. Recently I was walking through the local PetSmart and noticed a HUGE display of male Bettas. They were housed in individual cups with no more than 8 oz. of water per fish. The cups had lids and were stacked. It dawned on me that there was no reasonable way to get to all the cups to feed these guys. I am horrified if my suspicion is correct. Please tell me it isn't. Are the Bettas in stores like this considered "disposable?" I am wondering if it is the industry standard in this type of store just to order these fish, unpack them from the packing crate and leave them without care until they are sold or die?